If you know me personally or have been following my posts on our blog, you will know that I am quite the fanatic in keeping myself as healthy and as fit as I can, with all kinds of simple routines. Hence (thankfully, by the grace of God), at the age of 90, I am still as active as can be. Has anyone heard of the health benefits gained by using a bamboo beater to beat oneself with? No I am not a masochist, but if you ascribe to the oriental viewpoint of how to activate the circulation in your system, you will understand where the basis for this method is coming from. This being a simple but totally effective way to activate the circulation and the ‘chi’, thereafter, my level of alertness shoots up and I feel great. I can confidently say that it also helps me maintain an upright posture with ease. 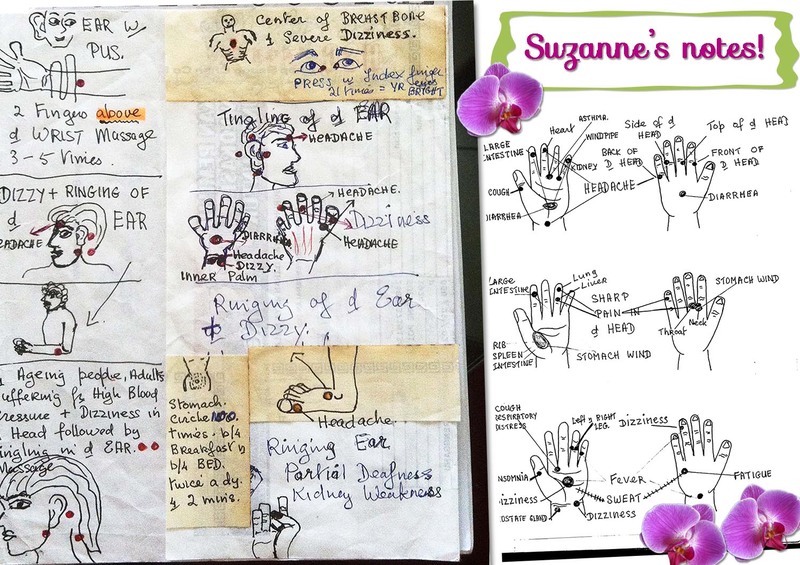 Suzanne’s daily routine – keeps her in good stead. Photos were taken in 2012 at the age of 88, but this year at age 90, she still beats herself up daily! 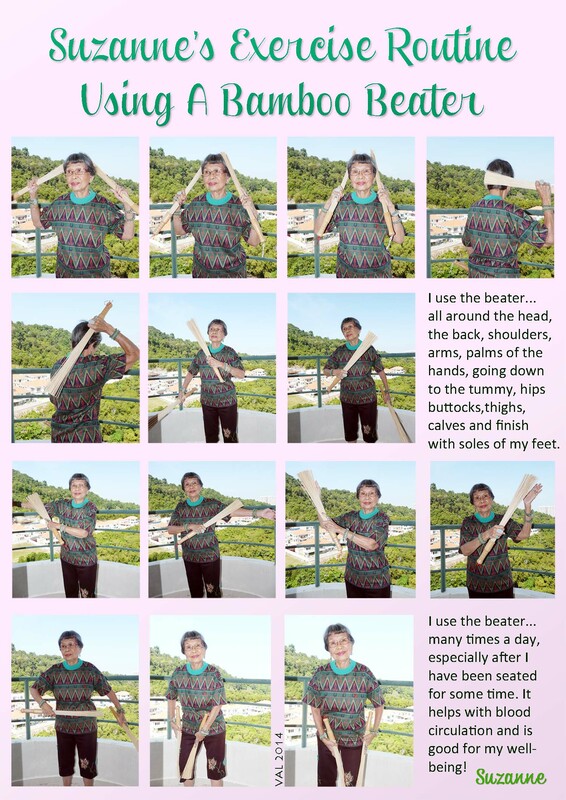 I use the beater to beat myself on all parts of my body – starting from the head downwards to the neck – shoulders – back (but not the spine) – torso – arms – palms – buttocks – inner and outer thighs – back and sides of calves – right down to the soles of my feet – several times a day. The photos above show where and how I beat myself. At each spot shown, I beat about 10 times. Suzanne shows the way to use the beater on her palm.. When it comes to the soles of my feet I continue beating up to the count of 100 on each foot. This works wonders for me and I do believe it contributes towards my ability to walk fast! Suzanne shows how to beat her shoulder blades with the beater. As to how often use the beater to beat myself… well, let us just say, at all times of day, whenever I have a few minutes free. If I have been seated for a while, out comes the beater to beat my palms and the soles of my feet. I beat my husband up too!!! (LOL) To be specific, I use the beater to beat the soles of his feet every day and night, and the back of his shoulders. It helps his circulation and relaxes the shoulder muscles after spending hours at the computer desk. 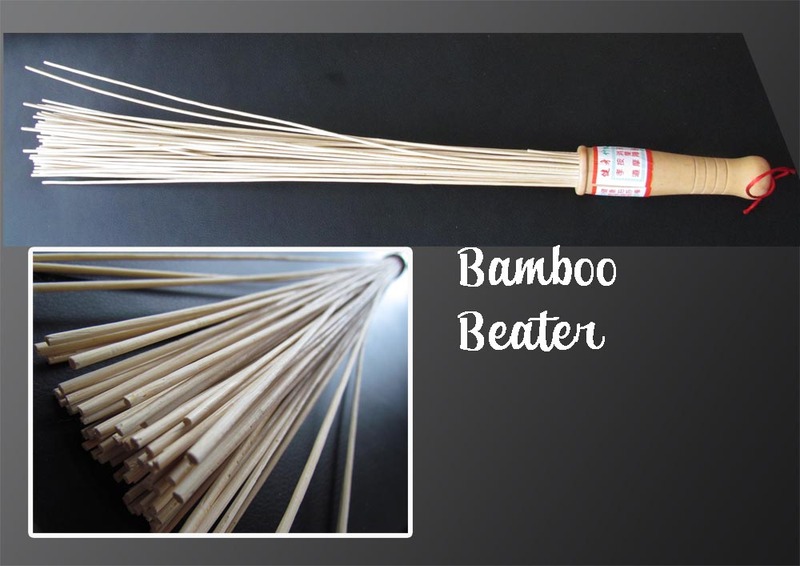 The bamboo beater that I use, as shown in the image above, is purchased at the local markets. Apparently these are made in China. They are pretty light but effective. I totally believe in this beating technique, and it suits me very well. However, if in doubt it is best to check with your physician first before trying it out. The important thing is to remember NOT to beat the spine. As I always say, all my keep fit routines are deceptively simple and easy to follow. The only thing is to remember that any keep fit routine needs to be practised regularly and consistently. I am an avid reader of keep fit techniques – from Acupressure to finger Mudras and anything else in between – as long as there is some knowledge to be gained in helping to keep oneself healthy, I will read it in-depth. In order to remember all that I have read up on, I do what comes naturally – that is, to illustrate the details that I would like to remember for myself, as easy reference at a glance. When friends come up with problems, I will dive into my reference books and research on what they could do to try to help themselves (as I do for myself) – and the best way to share with them the details – is of course, to draw them out so they understand what is to be done and precisely where..! Some friends are amused by my drawings, but apart from enjoying the artistic side of it, it is to me, the easiest way to ‘show and tell’. My drawings are found in all the books and reference material that I get my hands on. Here, I share some of my illustrations that I have done for friends. Suzanne’s Daily Art, if you would like to call it. Art brings me such joy and I am grateful for the ability to express myself creatively in every way. Amen.